The controller is used for belt misalignment compensation of steel belts, with and without V-ropes. On one side, the position of the steel edge is detected with an inductive sensor (contact free). Depending on the coverage of the sensor through the steel strip, is the analog signal from the sensor, used in the electropneumatic positioner for pneumatic actuation of the respective required pneumatic cylinder. 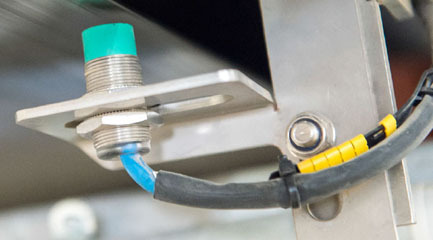 Pneumatic belt tracking control with contact-free belt edge sensing (inductive sensor). No wear of steel belt edges compared with mechanical roller systems. Inductive sensor resistant to dirt. A basic belt tension force is permanently generated by the system. Wear and tear of the V-ropes (if installed) is reduced to a minimum.